A new understanding of the post World War II era, showing what occurred when the British Empire wouldn’t step aside for the rising American superpower—with global insights for today. An enduring myth of the twentieth century is that the United States rapidly became a superpower in the years after World War II, when the British Empire—the greatest in history—was too wounded to maintain a global presence. 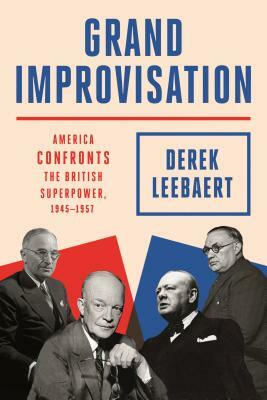 In fact, Derek Leebaert argues in Grand Improvisation, the idea that a traditionally insular United States suddenly transformed itself into the leader of the free world is illusory, as is the notion that the British colossus was compelled to retreat. The United States and the U.K. had a dozen abrasive years until Washington issued a “declaration of independence” from British influence. Only then did America explicitly assume leadership of the world order just taking shape. Leebaert’s character-driven narrative shows such figures as Churchill, Truman, Eisenhower, and Kennan in an entirely new light, while unveiling players of at least equal weight on pivotal events. Little unfolded as historians believe: the Truman Doctrine and the Marshall Plan; the Korean War; America’s descent into Vietnam. Instead, we see nonstop U.S. improvisation until America finally lost all caution and embraced obligations worldwide, a burden we bear today. Understanding all of this properly is vital to understanding the rise and fall of superpowers, why we’re now skeptical of commitments overseas, how the Middle East plunged into disorder, why Europe is fracturing, what China intends—and the ongoing perils to the U.S. world role. Derek Leebaert is the author of Magic and Mayhem: The Delusions of American Foreign Policy, The Fifty-Year Wound: How America’s Cold War Victory Shapes Our World, and To Dare and to Conquer: Special Operations and the Destiny of Nations, and the coauthor of the MIT Press’s trilogy on the information technology revolution. He has led a global management consulting firm for the last fifteen years and serves on the board of Providence Health System and other public service institutions. He is a former Smithsonian Fellow and professor at Georgetown University, and a founding editor of three enduring periodicals: the Harvard/MIT quarterly International Security, the Journal of Policy Analysis and Management, and, for investors and central bankers, The International Economy. Leebaert is also a founder of the National Museum of the United States Army. He lives in Connecticut and Washington, D.C.